After six weeks of embarrassment and two of mediocrity, the East finally had a breakthrough week in non-conference play, finishing Week 9 10-6. Time for the occasional celebration with a ham sandwich. Toronto, Atlanta, and Chicago cleaned up for the East while New York, well, no. Just, no. For the West, the Clippers and Nuggets struggled in their multiple non-conference games while Portland took care of business against New York and Philadelphia. Not sure which team is better than the other, but kind of want to lean towards the Sixers. Anyway, catch up on Week 9 and every other week if you’d like. Below is the week-by-week breakdown and the rest of the latest batch of non-conference scores. Experimenting with table formatting, if you didn’t notice already. If you missed Week 8’s summary, I also compared this season’s non-conference numbers with the last 44 seasons. 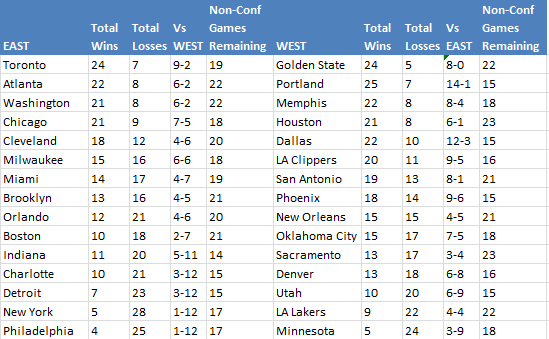 Turns out the West had a record-breaking win percentage, along with the third-best point differential. After Week 9, though, those numbers obviously took a hit and the win percentage is no longer the best mark ever. It could get worse as the better teams of the East start playing more of the non-conference games. Below is a look at the amount of remaining matchups for every team in both conferences. For the West, it’s somewhat balanced between how many of the East-West games have been played by the better or worse teams of their conference. Meanwhile, there’s been a problem in the East. Charlotte and Detroit are already halfway through their West schedule while Atlanta and Washington are only about a third of the way through theirs. The East has five niiiiice teams plus a feisty Milwaukee, but they’ve all played less games against the West than the bottom five in their respective conference. Which brings us to Week 10. 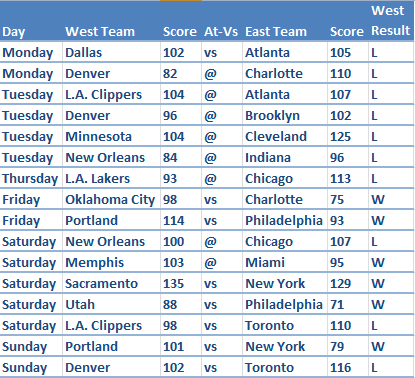 There are 22 non-conference matchups with Atlanta, Toronto, and Washington playing in 10 of them. The West will have a 16-6 home-road edge, though, as that’s one advantage the East had early on in the season, one that will vanish over this week and next. Enjoy the week. Curious how Week 10 ends up for the East. Things are starting to change in their favor, but I also need to dig a little deeper to confirm this, me thinks.